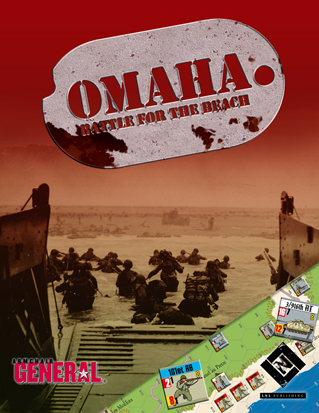 Omaha: Battle for the Beach depicts the fighting for Omaha Beach and the Normandy countryside behind it on June 6-7th, 1944. The player controls —by moving markers across the map and combating enemy units— the American and German formations that fought in the battle. The map covers a two-kilometer section of beach and the land behind it, including Charlie, Dog Green, Dog White, and Dog Red beaches. The counters represent infantry platoons (40-60 men), machinegun sections (4-7 men 2 machineguns), tank platoons (4 tanks), and gun batteries (4-6 guns). Each turn represents fifteen minutes to one hour. This complete downloadable PDF game features the beautiful art of Nicolas Eskubi, and can be printed and played in less time than it takes to watch Tony Soprano off a cousin. Fun, simple design, drop-jaw graphics, and no shipping! It’s a wargamer’s dream. Oh yeah, the T-62 is just a visitor from Valley of Tears, it isn't included in the game. Eighty-one beautifully detailed counters depicting the infantry, tanks, paratroopers, and gun batteries that fought for conytrol of the Omaha beach. Twenty-four action cards that trigger random events such as Allied airstrikes, the appearance of paratroopers, and German armor. Easy to learn game system. Complete game has six pages of rules. Lavishly draw map detailing Omaha Beach.